Family friendly holiday apartments (studio, 1-bedroom, and 2-bedroom) for one to six guests plus five motel style units (one double bed only). Fully equipped kitchens, free Wi-Fi, Foxtel TV, super-size swimming pool, barbecue facilities, guest laundry, and secure undercover parking. 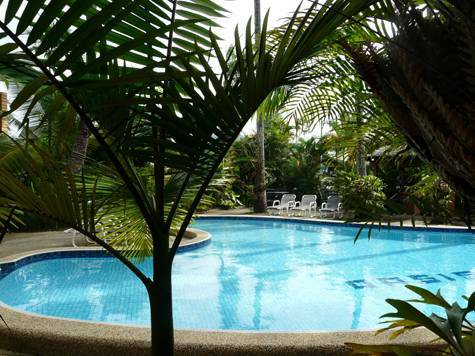 Conveniently located near the Esplanade, just outside the CBD, and central to all FNQ attractions. For the quick traveller. Air conditioned room with double bed. Tea and coffee making facilities only - no kitchenette. At least 72 hours notice is required by this property for cancellations of this room offer. If a cancellation is made within 72 hours of check in time, a refund is not available. For the quick traveller. Air conditioned room with double bed and kitchenette. 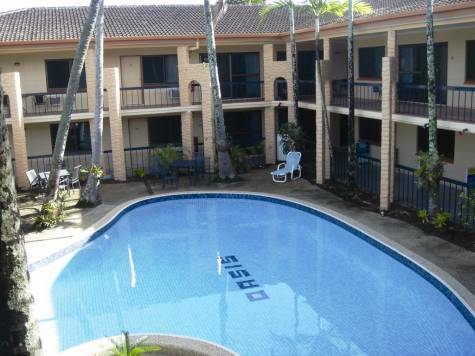 One bedroom apartment including lounge, full kitchen with appliances, one double and one single bed, Foxtel TV, free internet, free secure/undercover car parking, guest laundry. Two bedroom apartment including kitchen with coffee and tea facilities, double and 3 single beds, Austar TV, free internet available in all rooms, free undercover car parking.Guest laundry. Please note additional adult guests above 5 may be required to stay on a rollaway bed. Disabled Facilities Some ground floor apartments are easily accessible, although there is a small step-over to enter through the sliding doors. Distance to Airport Cairns Airport - 2km. Distance to Public Transport Bus - 30m. Reception Hours 7:30am to 7:00pm. Transfer Uber is available if you have the App. Driving Driving: The Oasis is located on the corner of McKenzie Street and Sheridan Street. Sheridan Street is also the Captain Cook Highway. Coming from the south on the Bruce Highway, just go through the CBD and head north towards the Airport. 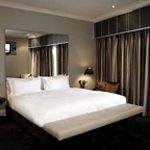 2 km from the CBD and a block north of the Captain Cook Statue you will find the Oasis Inn on the right hand side. Coming from the north on the Captain Cook Highway you will find the Oasis just past the Bendigo Bank. From the airport there is only one road out and it goes to Cairns. 3-4 kilometers from the airport there is a traffic light. Turn left at the traffic light onto Lake Street. Proceed south on Lake Street through to the third roundabout. This is McKenzie street. Turn right on McKenzie Street and go one and one-half blocks west. Between Digger Street and Sheridan Street on your left there is a gate to enter the Oasis Inn. You will need a code to enter the parking lot area.